Need a job? Plenty will be available in the water industry, according to Brent Haddad. Photo by Renee Flower. As the water industry braces for a "silver tsunami" of retirements in coming years, industry leaders are partnering with UCSC to cultivate the next generation of water-treatment experts. Led by environmental studies professor Brent Haddad, who directs UCSC's Center for Integrated Water Research (CIWR), the collaboration took a major step forward with a January 29 symposium attended by more than 30 students, faculty, and industry representatives. The "Symposium on How Higher Education Can Help Meet the Workforce Challenges Facing the Water Industry" included presentations by industry experts, a panel discussion, and the unveiling of three just-acquired advanced-technology water-treatment units that will give UCSC students hands-on water-treatment experience. Water utilities face a growing shortage of qualified workers as current employees retire in coming years, and industry representatives are eager to get the word out to students who may be interested in jobs as engineers, chemists, water-quality analysts, treatment-plant operators, electricians, and electrical component mechanics. Steve Dennis, emergency services supervisor and environmental compliance officer with the Alameda County Water District, jokingly referred to the impending retirement of so many experienced water-industry professionals as "a silver tsunami." Bruce Macler of the U.S. Environmental Protection Agency issued a call for "thoughtful, creative, imaginative, and willing people" to join the industry, and he asked students in the audience "What would work for you?" in terms of communication as the industry attempts to reach out to students. Cheryl Davis, manager of the Workforce Development Initiative with the San Francisco Public Utilities Commission, said her group is partnering with community colleges to develop pre-apprenticeship training programs. 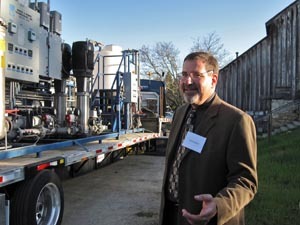 At UCSC, Haddad is helping prepare students for careers in the water industry. That effort will be boosted by CIWR's recent acquisition of three water-treatment units from the Lawrence Livermore National Laboratory. The equipment, originally used at U.S. military bases, became available after base re-alignment following the end of the Cold War. The units will give students and CIWR researchers the opportunity to operate water-treatment systems very similar to ones currently in use by water utilities, and CIWR affiliates will be able to conduct cutting-edge research that contributes to the ever-growing number of water-treatment technologies in use, according to Haddad, who has established a joint venture with the Monterey Regional Water Pollution Control Agency and the Marina Coast Water District. Called the Water Teaching and Research Laboratory, or WaterLab, the collaboration will facilitate training and development opportunities. Industry experts agreed that hands-on experience is a valuable addition to theoretical training. Already, Haddad and his students have combined practical fundamentals and theory: Several students are scheduled to take state-administered exams to become certified in water treatment and distribution. Haddad plans to take the exams himself, jesting "I'm kind of worried about my score." Dennis, also representing the California-Nevada section of the industry group American Water Works Association (AWWA), was eager to expand student interest in the water sector. Haddad encourages his students to participate in AWWA events to meet practitioners in the field; he and Dennis also made plans to build connections between students and younger professional members of AWWA through social mixers and other events. Formally recognized by UCSC in June 2007, CIWR's mission is to advance society's understanding of the policy, economics, and communication of freshwater management. More information about CIWR and its "Santa Cruz 20-20 Vision" to save $20 billion in water infrastructure costs over the next 20 years, is available online.